← All hail my wife’s ingenuity! This just in….cure found for tingle in Chris Matthews’ leg….developing. I strongly suggest you first read this prior post. https://thecvillean.wordpress.com/2011/05/25/medical-bulletin-doctors-discover-physiological-cause-of-tingle-in-chris-matthews-leg/ It will help greatly in understanding the significance of this news. For those of you who don’t believe in medical miracles, chew on this. Apparently, after nearly six years of suffering from a cruel affliction called LSFO, or to be more medically precise, Liberosocialisticfawnitisobamanosis Syndrome, Chris Matthews, MSNBC anchor, has found a cure. And it was right in front of him the whole time. Using critical thinking for the very first time after learning about something President Obama did, Matthews suddenly realized the tingling up and down his leg was gone. As might be expected with such an extended illness, a few minutes later the persistent tingling started to reappear. 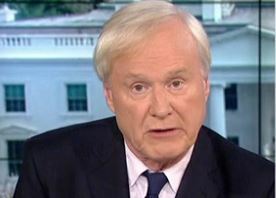 At that point, Matthews vocalized his displeasure with Obama’s recent prisoner exchange and voila’, the tingle was gone again. This entry was posted in "This just in...." and tagged Chris Matthews, LSFO Syndrome, medical miracles. Bookmark the permalink. 14 Responses to This just in….cure found for tingle in Chris Matthews’ leg….developing. I always appreciate your perspective on current events. I hope you are not offended. I think your dog was named Katherine the Great. I totally forgot. We will call our cat Kitty anyway. I was looking for a name with a cat in it. David hears the name Katherine and thinks of the Russian Czarina. He’s half Russian you know. How’s that for twisted logic? No, our dog was named Queen Abigail. She may have been descended from Katherine the Great, though. PS we stopped watching what’s’ is name the day he got that tingle. You might enjoy this…when I had the procedure at the hospital earlier this week, the woman who helped me into my “gown” and brought me the TV control says..you can even watch Fox if you want to. Why do you say that, I asked her? Because of what you said in the waiting room. Even though you’ve always been high on my list of favorite people, you’ve just moved up again! O and the gang that couldn’t shoot straight. What do folks expect when they elect a Senator? I’m only voting for Governors from now on…if they haven’t spent time in jail. A little time spent managing Rhode Island might prepare you for something more challenging. I wholeheartedly agree. Case in point…Sarah Palin was skewered as a VP candidate, but she had immense executive experience over Biden who was only a wishy-washy Senator. Now, based on the circus performance we have seen from Biden, who is the fool now? I’m encouraged, but being a realist, I suspect the condition may just be in remission. We can only wait and pray. Yes….wait and see…..I’m sure all 16 of his viewers are on the edge of their seats. It’s not just him, Peg. There are no true journalists anymore. Just sycophants and professional againsters.